Today’s consumers are much more self-directed in their buying habits, leveraging the internet and mobile technologies to research, review, interact and buy the products and services they need or want. As a result, many brands and marketers are shifting their marketing tactics to join consumers on their buying journey, rather than interrupting their day with a random cold call or talking at them as they flip through a magazine. That shift is toward inbound marketing tactics such as blogging, eBooks, whitepapers, social media marketing and dozens of other content marketing tactics—a way of effective marketing that TopRank Marketing is all about. And the growth and importance of inbound marketing is only going to grow, according to HubSpot. HubSpot—whose CEO Brian Halligan coined the term “inbound marketing”—recently released its eighth annual State of Inbound report, digging into where the “inbound movement” is and where it’s headed. They surveyed more than 4,500 marketing and sales folks from B2B and B2C backgrounds at small- and mid-sized businesses to uncover their challenges, priorities and strategies for the future. The results? Here’s what Halligan had to say in the opening introduction of the report. Below I dive into some of the findings that I found interesting, as well as some of the key takeaways that I believe will help marketers evolve their inbound marketing tactics and strategies. #1 – Sales and marketing alignment is a must. When it comes to generating more leads and turning those leads into sales, the old adage “two heads are better than one” couldn’t be more true. Sales and marketing teams that work together have a greater chance of success because it’s easier to track and measure ROI. According to the report, 82% of companies with effective marketing strategies say their sales and marketing teams are tightly aligned. An easy first step for aligning your teams is to meet regularly. Sales reps are constantly talking to and meeting with current and prospective customers, giving marketers the ability to tap into that knowledge to gain detailed audience insights. They can then use those insights to create content that actually resonate with their audience at all stages of the sales funnel, and ultimately bring in more qualified leads. #2 – Educating your audience is the key to success. Prospecting is one of the most difficult parts of a sales person’s job, and it’s even more difficult when they’re talking to prospects who lack knowledge about the company and its products or services. According to the report, sales reps report that prospecting becomes increasingly difficult as the amount of knowledge a prospect has goes down. What does this mean for marketers? It means that creating quality and informative content not only helps your target audience learn, but it also grows brand awareness—which can help drive more informed leads to your sales team. Use the knowledge you’ve gained from your sales teams, as well as any data you’ve collected, to create content concepts that will provide your audience with the best possible answer for any of their queries. Consider using a mix of inbound and content marketing that fit with how your audience likes to consume content. #3 – Having the right measurement tools is critical. According to the report, generating website traffic and leads, and proving ROI are the two top marketing challenges cited by respondents. With both challenges being metric-based, HubSpot cited the lack of the proper tools as the major driver of these challenges. At a minimum your website should have Google Analytics—or your preferred analytics tool—installed and tracking. The data collected will help you understand how people are coming to your site and how they’re interacting with your content. In addition, utilize the insights and analytics dashboards on your social pages to gain more insights. If you’re ready to go a step further, companies such as HubSpot, Marketo and Pardot offer paid marketing analytics and automation tools that can be incredibly helpful. #4 – Investments in visual content will continue. Humans are incredibly visual creatures. In fact, research shows that 90% of the information that comes to our brains is visual. So it’s really no surprise that visual content is proving to be more popular and engaging with our audiences—and marketers plan to up their visual game in the coming year. According to the report, 48% of marketers plan to add YouTube as one of their content distribution channels in the next 12 months. In addition, 39% plan to add Facebook video and 33% plan to add Instagram to their efforts. While visual content holds many marketing opportunities, don’t feel like you have to do and be everywhere. Choose the types of content and platforms that make the most sense for your business, aligning with where your audience is and what your ultimate business goals are. With that said, if you’re unsure—feel free to experiment a little bit. But make sure you’re tracking your efforts and results so you can see if it’s a worthwhile investment. #5 – Growing organic presence is a top priority. As Google continues to refine its search algorithms and grows its artificial intelligence programs, marketers are constantly fighting to keep and improve their key rankings. So, it’s no surprise that HubSpot found that 66% of marketers say growing SEO and organic presence is their No. 1 priority within their inbound marketing projects. SEO and organic search should absolutely be a priority for all inbound marketing efforts. But make sure you’re focusing on the right things. Put your effort behind the on-page aspects that will provide a better user experience, rather than traditional technical tactics like optimizing the metadata of a page. Of course, those technical pieces still hold some relevance to search engines, but focusing on really matters to your audience is how you’ll get the best results. Check out our post Understanding the Impact of Artificial Intelligence for a closer look at some of the recent changes in search and how to move forward. HubSpot’s report is bursting with more than 100 pages of interesting insights and findings. But one of my favorite takeaways came from Halligan. I think it really sums up why we inbound and content marketers love what we do. 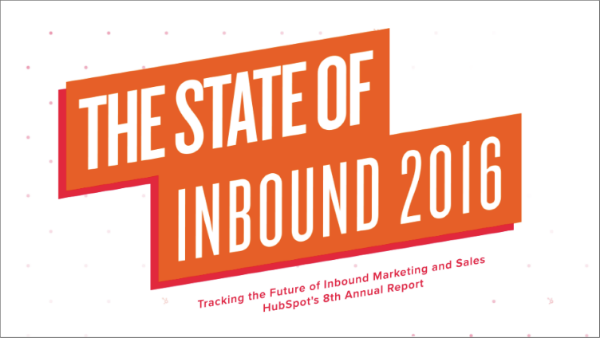 Download the full State of Inbound 2016 report. How will your inbound marketing efforts evolve in the next year? Tell us in the comments section below.